Kevin Durant on Congratulating Russell Westbrook on His New Contract: "Nah"
Development for the Fantastic Four reboot has been in the running for years but with director Josh Trank (The Kill Point, Chronicle) at the helm and Fox in final negotiations with Miles Teller (Dr. Reed Richards/Mr. Fantastic), Jamie Bell (Ben Grimm/The Thing), Kate Mara (Sue Storm/Invisible Girl), and Michael B. Jordan (Johnny Storm.The Human Torch), progress is definitely being made and it looks like that 2015 release date may stick. Wait. Hold up. Michael B. Jordan was cast to be The Human Torch? Ok, well maybe it wasn’t 20th Century Fox’s decision since Trank previously worked with Jordan in the sci-fi action thriller, Chronicle. Either way, I could only imagine the fanboys across the world having massive heart attacks because when there was a campaign to cast Donald Glover a.k.a Childish Gambino as the next Spider-Man in the reboot, the Internet definitely lost it. The campaign had so much racially-charged backlash, it was clear people weren’t ready for a black Spider-Man and Columbia Pictures chose to go with Andrew Garfield, a white actor, to play the role of the Marvel superhero. Now when it comes to the black-white Hollywood debate, I’m definitely torn. I believe minorities actors definitely need to be in more prominent roles, but I also know if people rather watch bootlegs than go out to the theaters to watch films with minority leads, how do we expect Hollywood to make such an exception? The only color Hollywood sees is green. It should be noted that Warner Bros. cast white actor Ryan Reynolds to play a comic book hero that’s been previously portrayed as black in Green Lantern (while Hal Jordan is a white character, Warner originally cast Common as Green Lantern John Stewart). Now while there are multiple Green Lanterns, there wasn’t any degree of antagonism with the switch, even though Green Lantern film sucked! I doubt it would have done any better with Common as the lead. Casting Michael B. Jordan may just be an opportunity to cash in with minorities because the guy is on fire as of late, no pun intended, but so what? This move may push Hollywood to take more chances to diversify. I say the superhero world could really use Jordan as The Human Torch right now, not as a racial statement, but because he would do some great things as the character. We need to stop seeing this as a black and white industry, Michael B. Jordan is, but isn’t, a black actor; he’s a young talented actor on the rise that got selected for a role. Let’s leave it at that. Besides we have more important things to be mad about in the superhero world, like Ben Affleck as the new Batman! Alan Scott was the original Green Lantern (1940). Hal Jordan was the next (1959), followed by Guy Gardner (1968). All 3 of them are white. John Stewart was introduced in 1971 and was African American. So they were cast as their appropriate race. Johnny Storm has been white since 1961. This article also fails to point out Johnny and Sue Storm are brother and sister. It isn’t as simple as SLJ as Nick Fury. Nathan, your passion and opinion, is definitely noticed and appreciated. As for Sue and Johnny Storm being related, can the storyline not be altered to show that their adopted? Comic book storylines change all the time, is it really that horrible that Michael B. Jordan was cast as The Human Torch? 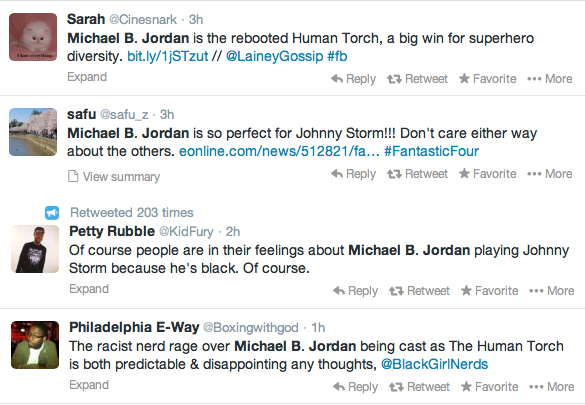 I don’t want to see a white T’Challa nor a white Shaft etc…The Human Torch just IS a white guy. He has been a white guy for 50 years. I just want these movie makers to stay faithful to the character portrayed in the comics. Don’t change the character that I’ve been reading for 35 years. I’ve been reading Black Panther for over 30 years as well. I would be totally pissed off if his race was changed for a movie also. I highly doubt we’ll ever see a white actor portray Black Panther before a black actor does but I do see the you guys are making. Now I’m not quite sure how up to date you guys are with comic books nowadays but publishers are creating additional universes and establishing a black Superman (Calvin Ellis), a black/hispanic Spider-Man (Miles Morales), etc. Is it wrong for publishers to do that as well? I just wanted to say – as a white nerd who loves comic books, I am more than happy with Michael B. Jordan as Johnny Storm. Kid is going to knock it out of the park. 1- I appreciate the “lets add diversity” to the normal lily white Hollywood landscape, but changing a title character with a long rich history is just ridiculous. Need remind the producers of the ill conceived “Billy D Williams” as “Harvey Dent” in the first Batman movie. Stop screwing up established comic book characters with your liberal Hollywood guilt. 2- Sue Storm has a younger brother, not a young brotha named Johnny. I doubt the back-story will be one of her parents getting a case of jungle fever. I suspect, he will be adopted (a nod to “Different Strokes” or more recently “The Blind Side”). We in the black community appreciate our rich white friends, helping raise our children while making a decent profit when selling the rights of their story to a studio. 3- Changing the skin color of an established character, to separate the new film from the old is simplistic. How about putting a film together that doesn’t stink. Sure the old films made money, but lacked: the family unity of the team, a May/December marriage, suit of armor for Dr. Doom, a cgi created Thing and of course not making Galactus look like a cloud. 4- With such a change, it’s going to be interesting how they explain this in the comics. Notice, after marvel movie come out, the characters in the actual comics tend to get their appearance and history altered. Unlike “Nick Fury”, who although popular, was not a central figure. It’s not going to be easy to “black wash” the character, you’ll just confuse all those new comic buyers who want their Johnny Storm with flavor. 5- At some point, a new game will be developed whenever we hear “Flame On” throughout the movie. I imagine many people taking a toke on their choice of bud.